Lakes are used for a variety of ecosystem services, but because of their enclosed nature and the slow turnover of their water, they are often susceptible to a variety of threats, among them the loss of ecosystem services and resulting disservices. Eutrophication, for instance, results in rapid growth of blue-green algae, which affect tastes and odors of drinking water. Algal blooms disrupt filtration processes during water abstraction and can be toxic, which may affect drinking water for municipalities. These issues stimulated intensive experimental and modeling studies to determine whether such changes were irreversible (Baerenklau et al. 1999; Wilson & Carpenter 1999). Lake Mendota in Madison, Wisconsin, is one of the most thoroughly studied medium-sized (approximately 4,000 ha) lakes in North America (Kitchell 1992). In the early 1980s, the combined decline of walleye populations and lost recreational fishing, together with concerns over unpredictable eruptions of noxious and sometimes toxic blue-green algae (cyanobacteria), led to a research effort demonstrating that water quality and food web management could be integrated. The management processes devel oped here and elsewhere were based on the trophic cascade concept (Carpenter & Kitchell 1993), in which enhanced populations of top piscivorous predators that feed on planktivorous fish led indirectly to the reduction of algal densities through the release of zooplankton populations that feed on algae. This approach of using one ecosystem function (predation) to enhance another (herbivory) and hence increase an ecosystem service (provision of high-quality water) has been utilized in a number of countries. In the case of Lake Mendota, management issues to solve conflicting service provision included: (1) trade-offs between increased stocking for walleye and northern pike fishing or managing for bass or perch (distinct "goods" for different people); (2) effects of increased water clarity (following removal of algae by grazing zooplankton) on deep light penetration, which can result in increased growth of submerged aquatic plants (that provide critical habitat for juvenile fishes, but can become weedy and reduce dissolved oxygen in the littoral zone during late summer and winter when the dead plants decay); and (3) disadvantages of improved water quality (clear water with lower concentrations of dissolved nutrients), which made it difficult to fulfill the demand for recreational fishing. 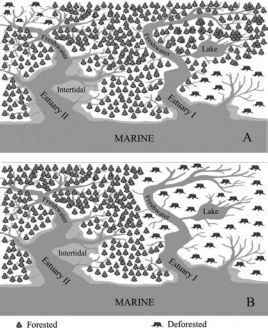 These integrative studies led to new questions about how management can enhance ecosystem services in freshwater bodies: How are "distinct" ecosystems, with apparently clearly defined surface boundaries (e.g., small ponds, large lakes, and rivers), interconnected hydrologically over time and space? How might these linked ecosystems function and affect each other in predictable ways? Why must fisheries biologists add fertilizers to increase fish production in some locations (hatcheries, aquaculture ponds) when water-quality engineers are designing treatment plants to remove nutrients in other "downstream" locations (groundwaters, rivers, and lakes)? Is production of fish for food versus recreation a necessary trade-off? Or can aquatic ecosystems be managed to optimize complex production functions? Can natural processes of nutrient cycling and organic-matter breakdown provide supplemental services that could save construction of new treatment plants? Answers to such questions have emphasized that sedimentary deposits and the species that live in these substrates are key regulators of nutrient cycling and productivity of different forms of plants. These basic elements of nutrient cycling (bottom-up control) interact with the effects of open-water predators such as fishes (top-down control) to jointly influence entire food webs (Kitchell 1992; Carpenter & Kitchell 1993).